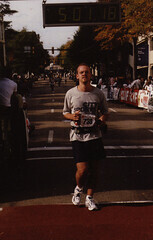 In the fall of 2002, I ran a marathon. It was one of the hardest things I’ve ever done, and the training alone resulted in a pair of knees that would never really work the same. Battered by a rough 30K a few weeks before the big event, my knees hurt every step of the way, and by the last 8 miles or so, it felt like someone was taking a hammer to each kneecap every time my sole hit the pavement. I present exhibit A at right: a photo of my agonizing 5:01 finish. Since then, I haven’t been much of a runner, first because I was physically incapable and then because life and habit crept in and a touch of laziness conspired to keep me fairly sedentary. Kristina, on the other hand, after a hiatus, took her first marathon (she ran with me, most of the way, before pulling ahead for the last few miles) as a challenge to do more. Her efforts, both raising money for charity and for her own self-discipline and single-minded devotion to accomplishing something important within in her and around her have truly inspired me. Recently, though, I decided to stop simply being jealous of her drive, fitness, and accomplishments, and allowed her to rope me into being the second half of her marathon relay team in February. I’ve only been running in earnest for a few weeks, and only legitimately “in training” for the last week or so, but already I feel worlds better for being a part of something like this again. Running is something the two of us can share again, even if we rarely get a chance to actually run together, and getting in shape has done a lot for me, both physically and emotionally. Best of all, my knees have actually let me do it. I’m crossing my fingers that they continue to hold out. Today, I’d planned to run 6 miles, which isn’t too shabby and would tie (I ran it last weekend too) my longest single run since the marathon in 2002. But she once again inspired me to push myself, by bringing to my attention a fellow running blogger’s challenge to run “8 on the 8th.” Today, I did my 8 miles (in 1:06), and it felt great. Here’s hoping everything continues to go smoothly as I step up the mileage leading up to the February race. Who knows? Perhaps these old knees will let me go another 26.2 some day. Holy crap, if I could run it in 1:06 I would never ever stop again. 😀 Awesome job. I am so glad you are coming back and that my little brainstorm of a way to keep myself running has done the same for others. And YEAH Kristina for your dedication and for getting him back out there! Thanks for joining us! Look for results late Sunday or early Monday — I want everyone to have a chance to post. I second Nancy’s comments; incredible finish for just deciding to lace up and give it a try. I’ve had to bust my hump for over a year to get where I am. Congratulations! By the way, I think this is the most unique male runner’s blog around! Very cool that you can knit. I can tie my shoes all by myself, but that’s about all. I look forward to reading more. Way to go! Definitely an impressive finish.